Grout refers to a compound that fills gaps or seals joints. It is sometimes called caulk, and less often, mortar. Depending on the application, it can be made from a number of different compounds. Grout that is also a sealant needs to be water resistant where other types of grout may need to be strong or have special binding properties. When evaluating your application, read the manufacturer's suggestions for the most appropriate grout for the job. If you are purchasing all your materials separately, don't assume that grout is the last and least important item in your list of materials. 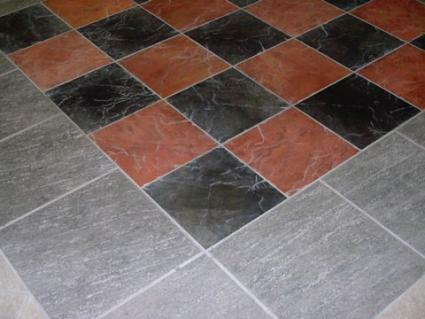 Grout can make your installation more attractive and durable. It can also help protect your home from water damage and problems with toxic mold. Portland Cement - This is the most common variety of grout for general applications. It is often used in tile work. Portland cement is typically purchased as a powder made up of limestone and shale or clay. It is mixed with water to form cement when dry. Epoxy Grout - Learning how to apply grout composed of epoxy may take extra precautions on your part. Cleanup could require a couple of extra steps, so make sure to read the manufacturer's directions before you begin. Epoxy grouts cure as a result of chemical reaction, and temperature can have an impact on how well they will cure and how long curing will take. Pay particular attention to temperature, ventilation, and cleanup instructions before you apply epoxy grout to your project. When using grout that requires mixing with water, be careful to use exactly the amount of water indicated in the directions and incorporate the water into the mixture uniformly. Poor mixing is one of the most common mistakes in grout installation. If your recipe is off, the end product may never set properly or could remain soft for months if not longer. Prepare the surface to be grouted by removing any adhesive protruding into the joints or on the surface of the tile. A utility or craft knife will help you remove residual thin set and adhesive residue. When using Portland cement based products, add water to the joints before applying grout. The water shouldn't puddle, but should be enough to cover the area. This will help insure that moisture isn't drawn out of the mixture before the grout has had a chance to cure. Mix and apply grout with a grout float. Hold the float at a 45-degree angle and press grout into the joint using even pressure. Don't overload the float with grout. Grout will start to dry faster when it's removed from the bucket or can. Start in an inconspicuous area and work in small sections, particularly to start. If you've never worked with grout before, your technique will improve as you go. Try to confine your initial efforts to areas of your project that are less visible, like corners or around the perimeter of floors. Pull the grout float on a diagonal across the tile to finish filling the joint. This will help you scrape away the excess and bring the grout level with the surface of the tile. Use a damp sponge to clean the tile and create a smooth joint. It's important to know that tile is rated for softness and wear. When applying grout to soft surfaces, use caution. Try adding grout to joints only, and avoid scrubbing or scraping the surface of the tile itself. This will give the job a professional look without leaving behind any damage to the tiles.